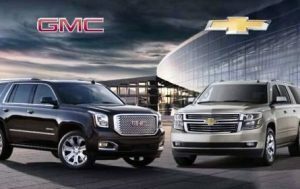 General Motors has issued a recall in the United States for over 1.2 million Chevrolet, GMC, and Cadillac vehicles. The recall extends to 2015 SUV and pickup truck models including the Escalade, Yukon, Tahoe, Suburban, Silverado, and Sierra. Of those, the Silverado has proven the most affected model with over 450,000 included in the recall. Thus far, GM is aware of 30 accidents and 2 injuries related to the issue prompting recall. Drivers of the affected vehicles may encounter a temporary loss of power steering. GM states this most likely occurs while taking low-speed turns. The abrupt loss of power steering is extremely dangerous and can reduce driver control of the vehicle and increase the risk of an accident or collision. GM will contact owners of the affected vehicles and instruct hem to make an appointment with their local dealership. From there, dealers will fix the vehicle at no cost to the owner. To solve the issue, updates will be made to the vehicle software system. A date has not been set for when the recall will begin, however GM has a recall search tool online to check if your vehicle has been affected.